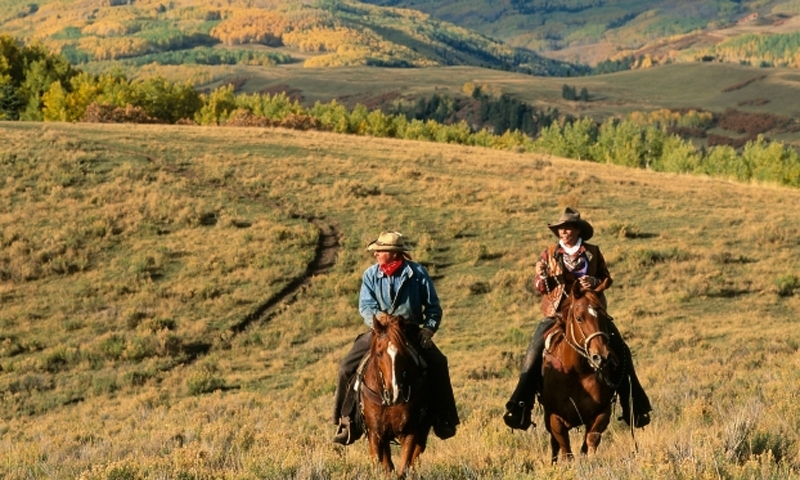 For an authentic Western-style horseback riding experience, hire a local outfitter to take you and yours on a trail ride in the breathtaking Aspen-area backcountry. Numerous private outfitters offer adventures for both noviced and experienced horseback riders. Grizzly Lake and Capitol Creek Trails, among many others, are popular trails into the backcountry. White River National Forest offers nearly 2000 miles of public trails, most allow horseback riders, in addition to hikers and bikers. Call (970) 925-3445 for more information. Grab a wide-brimmed hat, your best worn-in boots and your sturdiest pair of jeans! Get yourself ready for Western-style riding in the Roaring Fork Valley. Afterall, riding horses might be one of the longest-held traditions in the American West, and Aspen, along with its neighboring towns, has kept up that tradition in proud fashion. Capitol Creek Trail - Located in the Maroon Bells-Snowmass Wilderness, this trail sees fairly heavy use from both horseback riders and other recreationists. To trailhead: drive 14 miles west of Aspen on Highway 82. Take a left at Snowmass Creek Road. Drive 2 miles until you reach a "T" intersection. Take a right and drive another 5 miles. The road turns to dirt at mile 2 and demands 4WD for the last mile. Grizzly Lake Trail - Located in the Collegiate Peaks Wilderness, this trail offers high altitude views of its beautiful surroundings. To trailhead: drive 11 miles east of Aspen on Highway 82 to Lincoln Creek Road. Follow this road, which necessitates a high-clearance vehicle, for 6 miles to Grizzly Reservoir. Trailhead is on the left after passing the reservoir. For more suggestions on where to ride, contact Aspen Ranger District at (970) 925-3445 or visit the White River National Forest homepage. Considering the wealth of possibilties for trail rides in the Aspen area, hiring a guide through an outfitter or ranch is certainly the way to go. These professional, experienced businesses pride themselves on being able to fully outfit anyone interested in travelling in the backcountry on a horse. Whether you are an experienced rider or trying it for the first time, explore the options the many area-businesses have to offer. You won't regret it. Generally, you should expect to find that less than $100 will get you 1-2 hours on a trail ride. For around $250, you should be able to arrange an all-day trip. Prices for multi-day trips vary, depending on distance travelled and accomodations provided. Way of the Horse is a "horse whisperers" site on how to improve a horse/human relationship.